Book Review: THE BEAUTY OF SCENT. A review of Scented Buds. THE BEAUTY OF SCENT: A review of Scented Buds. Scent is beauty. The beauty that rules a certain psychological inclination we often have with the society. Thus, making us feel the crawl of incompleteness when not garbed in a "sweet smell" that registers our presence and gives us a distinct stance amongst friends and foes alike. An Indian mystic known as Ramakrishna once said that, "the fabled musk deer searches the world over for the source of the scent that comes from itself". In a bid to reach perfection, Artists in some cases could distort an art work which pleases the taste buds of connoisseurs only to bring forth an image deeply buried in their minds alone. The beauty of the sea is in its ripples but we are often thrilled by its calmness. Scented buds is an anthology of poems and short stories published by the Corp members of Education development and ICT Community Development Service (CDS) group, Kano for secondary school students following a one-day Creative Writing workshop the CDS group organized for the teens in November 2016. It is a book of fifty pages with 26 poems and 16 prose works. These two genres are put into two parts in the book with the poems coming first while the prose comes after it. It is however a thing to note that the ironic depiction of 'buds' with 'chicks' on the cover page is a masterpiece. Unlike the norm of having 'plants' as a direct representation for 'buds', The reader is met upon arrival with chicks struggling to break out from their shells(indeed, the corp members have brought these kids out from their shy shells). These chicks are expressed on the cover page as frail and lost subjects which aptly captures the situation the kids were met. The correlation of the title and the book art can't be queried as there's a beautiful romance between the two. SCENTED which is pictorially represented with a mother-hen seen diligently guarding her chicks and serving as a guide to them through whatever appears grey to the chicks that are just initiated into a new 'world'. There couldn't have been a better metaphorical stance between the Mother-hen and the Corp members. BUDS: The choice of having chicks instead of plants is a creativity to be applauded even though the line of thought is same. A bud breaks the soil to sprout and thus, breaking it's own shell. A chick breaks it's shell to become a 'bud'. Therefore, the inline connection that exist between the title and the art would take more than just aesthetic appreciation to decipher. "The best amongst all friends"
"He's got a knack to learn"
The writer makes us understand in this piece that, He's chosen Musa as his best friend because Musa reads everything that's got words in it. The writer is then very selective of who becomes his friend because he's aware that the friends one keep defines his attitude and how he relates with the society. It is a good thing that he's keeping a friend that's obsessed with books. This could have been the reason behind the choice of his title. Maryam Abdullahi Yunusa in her 3-line poem made me immediately call my mother to recite her the piece. This lass beautifully said everything about her mother in the poem she called "Mom"
"You are the sweetest sweet"
"My endeared land of happiness"
"Never tired nor torn by life's tide"/ we all have things to say about our mothers, but Maryam said everything in 3 lines. One other thing about this child is her ability to drag her reader into her emotions. This is seen in her 2nd poem titled "My love"
Her ability in use of simple metaphors is her forte. "Creates cascading oasis in my eyes"
The kid in the 2 poems obviously showed the bond between herself and her mother. Indeed, The future for Maryam Abdullahi can best be imagined if the tempo is sustained. When our dreams are cut short by death, who do we blame? In the piece written by Latifa Sani Abdullahi of Floral International school, she leaves the reader dampened with sober emotions. Her poem which she called "shield" is a dirge in its entirety. The fluidity of her enjambment is stunning. She is a keen observer of nature to have succeeded in creating a metaphor of "slept" instead of "death" at her age. Isn't sleep another form of death? Looking at the prose works, the kid told their stories in a nonfictional way. Most of the writings gushed out with traces of the writer in them. Writings like "And I fulfilled a part of my deen" by Zainab Isah Abba of Sahib Science school talks about the teenager's experience and excitement when she memorized the holy Qur'an. "Dirge to my icon of icons" is another nonfictional piece written by Aisha Ahmad Bukar of AB Reward schools. The piece brought to fore the anguish this child faced as a result of the death of her father. It is scary that these children remind us of our eminent demise. Someday, our switch will be turned off by the one who owns us.These kids took me on a tour into a world that amazed me. 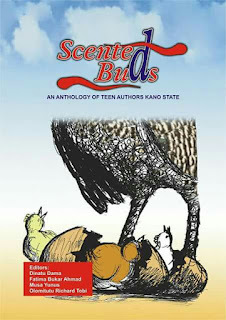 Kano should be proud of the young writers in its core. Scented buds justifies every purpose its been created for and will for a long while be cuddled by the teens and anybody that runs into it.